It’s all about learning. In order to teach, we need to continue learning. At the beginning of the month we attended the Screencast Camp held at TechSmith Corporation in Okemos, Michigan. During August, we taught our hands-on Picasa Photo Editing class 3 times. Twice in the Quad-Cities and once at the FMCA Convention in Indianapolis. Click the picture at the right to see a video of us on the Paula Sands TV show in Davenport, Iowa. Sep 16-21: Escapade in Sedalia, MO. We will be trying Google+ Hangouts as a way to have impromptu meetings and training sessions. But, first, we need to just get used to how it works. If you’re interested in trying it with us, mark your calendar for Sep 25 at 4pm Eastern Time, and Sep 26 at 11am Eastern Time, then go to our Geeks on Tour Google+ page and leave us a comment. We’ve been followers of all the RV News and stories at RVTravel.com for many years. Chuck Woodbury writes a newsletter *weekly* !! Every Saturday morning you can depend on reading his personal RVing stories as well as industry news. So, it was quite a treat when we discovered he was parked right next to us while at the FMCA Convention in Indianapolis. Both of us were quite busy, but we found time to have dinner one night, swap RVing stories, and even record a couple of videos. Sign up for your FREE RVTravel.com online newsletter and stay on top of all the news information and advice to RVers about the RV lifestyle, plus tips about how to maintain your RVs. We’ve been teaching Photo Story 3 for several years now. It is a free program from Microsoft that was developed for Windows XP. In fact, the download page still says that it is only for Windows XP, and newer versions of Windows are not supported. We use it on Windows 7 and it works fine. The only quirk we’ve noticed is that, when you download it, it’s important to use Microsoft’s Internet Explorer to do the job rather than Chrome or Firefox. We love teaching Photo Story 3 – it is the easiest topic we cover. People who consider themselves computer illiterate leave our class and go straight to their computer to make a professional looking movie with their pictures, music, and narration. We try to keep up with the times, so have been looking for a replacement for Photo Story. We simply haven’t found one. We just taught the seminar last week at the FMCA convention and we thought it would be the last time we taught it, but it was so well received! One person told us afterward that it solved a dilemma for her in that she had been asked to provide videos of her Church project and she just didn’t know what to do since she had no experience with video. With Photo Story 3 she could simply use the dozens of photos she’d already taken, add motion, narration, and music. Voila! She has a video of her project. When you first open Photo Story 3, you are prompted to begin a new project and import pictures. We recommend using Picasa to prepare all the pictures you want to use and export them into one folder so they are easy to find. Then, Photo Story 3 works like a wizard, when you’re finished with the first step, you click the button to continue, and it tells you what the next step is. When you’ve run out of ‘Continue’ buttons, you’re done! One of the steps is narration. There is a place where you can write notes for yourself about what you want to say. Each piece of narration is attached to a picture – which makes it much less intimidating than having to narrate an entire slideshow. Just add narration to the pictures that need it. The rest will just play to the music. There is no copyright, so you can upload to public sharing sites like Youtube without running afoul of their terms of service. Why settle for boring slideshows when you can direct and produce a movie for free. We have 11 tutorial videos on Photo Story 3 that show you how, step by step. Or you can just download the software and start playing! If you make a movie and upload it to somewhere that we can see, leave a link in the comments OK? Here is one that I made about my family’s early RVing experiences. CoPilot Live Premium, North America Maps $17.99 for iOS and Android. For complete pricing and map availability, visit their website at www.copilotlive.com. There is a free version, but it does not offer voice-directed turn-by-turn instructions. Technology can make travel a richer experience. Teaching technology to travelers is what Geeks On Tour is all about. We have been using GPS for navigation since we started RVing back in ’03. Keeping up with this stuff is a full time job and we love it. Visit us at www.geeksontour.com. Don’t get rid of your paper maps and atlases. Do get the CoPilot Live app for your mobile devices – we like it. It is available for Android phones and tablets, iOS iPhones and iPad 3G, Windows mobile, and laptops, too. Be sure to read thru the excellent user guide available on their website under the Support menu. ALK, the company behind CoPilot has been in the business since 1979. They know what they are doing, and they do it well. 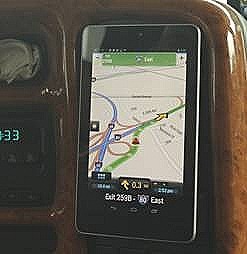 I first got the CoPilot app for my Droid RAZR phone and used it in our travels from Louisville, KY up through New Jersey, New York, and New England. While in Vermont, I bought the new Google Nexus 7 tablet. The main reason for getting the tablet was for navigation. This review is based on those 2 devices. Published by MrsGeek, in Newsletter. Tagged with CoPilot Live, Google Hangout, Narrated Slideshows with Photo Story 3, Verizon 4G.